If you are new or it has been more than a few months since your last visit, I request that you review my Payment and Service Policies and the Client Agreement and Disclaimer at the bottom of this page. For first time clients I recommend reading the information on the two pages, Understanding Colon Health and Menu of Health Options. There is also a Client Intake Form and a Metabolic Screening Questionnaire that I request you print, fill out, and bring with you at the time of the first visit. If you have any questions please call me: 541-513-7894. I look forward to serving you! Thank you and many blessings of health and joy to you! familiarize yourself with the LIBBE colon hydrotherapy device. My home and office is on Lake Drive within easy walking distance from Emerald Park and the River Road Recreation Center. My office address will be given at the time your appointment is scheduled. Please park in the driveway and walk around the left side of the house through the gate into the garden sanctuary. A brown door on the right welcomes you into the healing sanctuary’s relaxation waiting room. If this is your first visit, please fill out the first time client information sheet and I will greet you promptly. 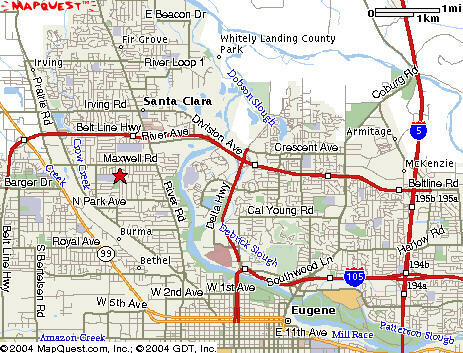 If you are coming from out of town see below for the area map of Eugene and driving directions. My office location is indicated by the red star on this map. If you have questions you may contact me here. Follow Beltline to River Road Exit. Follow River Road approx. 3/4 mi. Turn right on Howard (1st light after Maxwell). Go 0.9 mi.to Lake Drive and turn left. My driveway is on the left. If you pass Emerald Park you've gone too far. Follow Hwy 99 to Beltline. Get on Beltline headed East. Take a right on River Road (headed South). *Session charge will increase if additional consultation time is required, or session is scheduled outside of regular business hours. Health Inspiration Consultations are $120.00/hour for non-clients and $60.00/hour for current clients. Sessions away from Alder Brooke are $120.00 an hour plus travel time and gas. Cash and checks are preferred. We also accept MasterCard, VISA, Discover, and American Express. All appointments are scheduled considering a reasonable grace time. Promptness is appreciated. If you expect a delay, notification may be helpful and a shortened appointment time may be necessary. Full fees are still expected. $60.00 an hour is the fee for consultation for current clients. Additional time for sessions will be subject to this fee when longer appointment time is required. Please respect our scheduled appointment time. I request 48 hours notice if you wish to reschedule or cancel. Appointments rescheduled or canceled less than 24 hours in advance will be charged as a missed appointment and billed at the full rate. Price reductions available when appropriate and feasible. Billing Insurance: I currently do not bill insurance. For clients who wish to bill their insurance provider directly you may wish to consult the page of CPT and ICD-9 codes for colonics here. If you require service outside of our regular business hours, call us for availability and pricing. Your health history, current health and health goals are always considered while reviewing your service request at Alder Brooke Healing Arts. 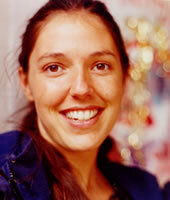 Thank you for keeping Alder Brooke Healing Arts apprised of any health related events so we can best serve you. First time session consultations include an educational experience to help you gain the knowledge necessary to complete your colon hydrotherapy session. We also assist you in learning how you can better affect your health considering your food choices, lifestyle and health service needs. Clients must be 18 years of age or older. For women on their menstrual cycle: It is perfectly fine to have colonics during menstruation. Please help keep this a chemical free space and avoid the use of perfumes, products or smoking of any sort prior to your visit. Thank you for considering others. Please arrive in a calm, relaxed state on time for your appointments. Thank you! This is not a sexual service. This is a therapeutic service and any sexual remarks or advances will terminate the session and you will be held liable for payment of the scheduled appointment. If you have any questions or concerns before this appointment, please call me: 541-513-7894.
Who would NOT be a candidate for colon hydrotherapy treatments? If you have a concern about your health or the appropriateness of colon hydrotherapy you should consult a doctor. If you are diagnosed with lupus, diverticulitis, ulcerative colitis, Crohn’s disease, severe hemorrhoids, rectal or intestinal tumors, have undergone recent radiation therapy, have uncontrolled hypertension, congestive heart failure, or organic valve disease, have an aneurysm, severe anemia, GI hemorrhage/perforation, cirrhosis of the liver, fissures or fistulas, have an abdominal hernia, have had recent colon surgery or renal insufficiency then you would NOT be a candidate for colon hydrotherapy treatments. Pregnant women are also advised to only receive colon hydrotherapy during the second trimester of their pregnancy and under the direct supervision and advice from their physician. Professionally administered colon hydrotherapy is generally safe if you are free of the above cited conditions/contraindications. I have not been diagnosed with any contraindications for colon irrigation. (See above.) I am aware that colon irrigation and enema device facilities are NOT physicians and therefore does not INSERT, diagnose, or prescribe. I am aware adverse events such as perforations, injury, and illness have been alleged and claimed with the use of colon irrigation and enema devices. I am responsible for my own insertion. If I experience resistance during the insertion, I will immediately stop my session. If during the session I experience discomfort or pain, I am responsible for immediately stopping my session. I agree that the information I have given is accurate to the best of my knowledge. I give Alder Brooke Healing Arts practitioners permission to share information with each other and the prescribing doctor, and to evaluate and provide colon hydrotherapy. I am aware of and do not have contraindications. I have reviewed a copy of Alder Brooke Healing Arts Policies, as well as a list of the contraindications for colon hydrotherapy and I hereby agree that I am responsible for my health and the services received here. I am aware of my 9th Amendment Rights to practice alternative health modalities. Note: Clients must be 18 years of age or older. I am not intentionally withholding medical information from the facilitator which is important, and I understand the procedure of Colon Hydrotherapy, the device, and possible side effects which have been explained to me. All of my questions have been answered and I agree to participate with this session. Your health is our joy! Thank you for choosing Alder Brooke Healing Arts!